Soan Papdi price varies from one vendor to another vendor depending on the ingredients they use in making the Soan Papdi. 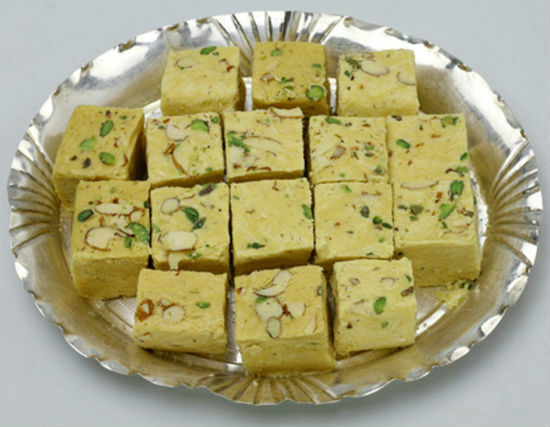 Soan Papdi is an Indian sweet which is mainly made of Sugar,Gram flour,flour,ghee, milk and cardamom. But the preparation varies from state to state and we can add more ingredients to make it more sweeter and tastier. Surdhenu is a leading manufacturer of Soan Papdi in India. We follow some unique methods to prepare Soan Papdi and this has made us the leading manufacturer of Soan Papdi in India. Be it any occasion, nothing adds to the celebration like Surdhenu’s sweets. 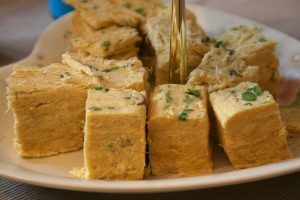 We will make Soan Papdi from the finest Indian recipes of the past which gives a unique and great taste to the Soan Papdi. We manufacture 5 varieties of Soan Papdi flavors and each flavor has an unique taste and texture for it. Our Soan Papdi is so famous that we manufacture a total of 3000 tonnes per annum and we will export to 8 different countries around the world. We have many corp orates are our clients and our Soan Papdi price is relatively less when compared to other Soan Papdi varieties in the market. Chocolate Soan Papdi is our unique product and it has a taste of chocolates when we eat. Made of refined Palmolive oil, wheat flour, chick peas flour and Cocoa powder this sweet stands first in terms of taste. Made by the professionals with some unique skills the chocolate Soan Papdi is the best sweet for your taste buds. You can check the price and buy the Surdhenu Chocolate Soan Papdi here. What makes Soan Papdi a best sweet in the world of sweets? We had done so much research on this and found out that when we add Ghee and it gets more tastier in terms of taste and also the texture of the sweet also changes when Ghee is added. we have proved this point in our lab and when we asked the people to taste this particular sweet we got a positive response from all over and this gave us confident to do different varieties in Soan Papdi. You can check the price and buy the Surdhenu Pure Ghee Soan Papdi here. Elaichi has a unique place in spices and has a great taste also. So we have found out this point and went to lab thinking how to add Elaichi to our Soan Papdi so that people can taste a unique dish. So we have made so many experiments and finally we have achieved one unique dish which have the flavors of Elaichi in it. This also when tested, had a positive response from all over and this has the highest selling record in all of Surdhenu’s products. 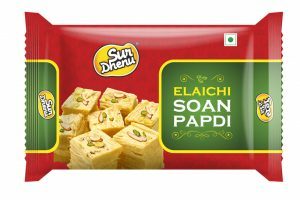 You can check the price and buy the Surdhenu Elaichi Soan Papdi here. We have a city called Nagpur in India which is famous for oranges. It is rustic and pockmarked exterior which is sweet and has juicy pulp. It gives the city of Nagpur its pseudonym Orange City. So we had taken the flavor of oranges which are grown here and applied to our Soan Papdi and mixing these two products had a byproduct which has a unique and wonderful taste. People who had tasted this product has agreed that we had made a better sweet. You can check the price and buy the Orange Soan Papdi here. When we see all types of Soan Papdi’s in the market, it comes only in one shape and that is cubicle. So to make the transport easy and also to fit in the mouth easily we have come up with the Soan Papdi rolls which we have changed the shape from cube into circle. We ha maintained our same taste for this sweet also and this also has high sales. You can check the price and buy the Surdhenu Elaichi Soan Papdi Roll here.